Incidentally, the above equation demonstrates that is a proper vector, since the left-hand side is a scalar, and, according to the properties of the dot product, the right-hand side is also a scalar, provided that and are both proper vectors ( is an obvious vector, because it is directly derived from displacements). So, is perpendicular to . 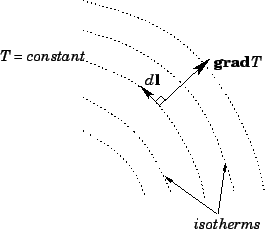 Since along so-called ``isotherms'' (i.e., contours of the temperature), we conclude that the isotherms (contours) are everywhere perpendicular to (see Fig. 17). 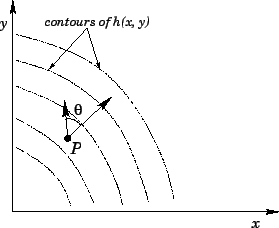 where corresponds to the line integral around some closed loop. The fact that zero net work is done in going around a closed loop is equivalent to the conservation of energy (this is why conservative fields are called ``conservative''). A good example of a non-conservative field is the force due to friction. Clearly, a frictional system loses energy in going around a closed cycle, so . It can be seen that the differential operator transforms like a proper vector, according to Eqs. (10)-(12). This is another proof that is a good vector.